Right by the Atlantic coast, hidden in a small bay on Achill Island, you will discover the most westerly public garden in Ireland. The 3 acres of gardens belong to Bleanáskill Lodge which was established around 1870. The house can be found in a quiet hamlet, two miles from Achill Sound. From here you have a view over to the Curraun Peninsula and the waters of the Sound. The garden is situated by the sea. The core part of the garden was established through the planting of Monterey Cypresses, roughly 100 years ago. According to his own, still existing diary, the painter Alexander Williams himself introduced a vast range of plants and trees, like the line of still existing Rhododendrons which he planted on April 17th 1907. For ten years, from 1970 the property was owned by Lady Noël and Sir Anthony Bevir. Lady Bevir grew vegetables and sold them to her neighbours. The plot she used is still called ‘Lady Bevir’s Nursery’. Roderick Heron, brother of sculptress Hillary Heron bought Bleanáskill Lodge in 1980. He improved the soil of the property largely by bringing tons of sand and compost on the boggy underground. In the summer of 1997, Willem van Goor and his family emigrated from the Netherlands to live on Achill Island. With their residency, the garden was transformed into a beautiful, romantic shrub garden, and the remaining nine Monterey Cypresses in the oldest established part form a huge, dark cathedral. Being a working artist and also an expert gardener, Mr. Van Goor redesigned the property into what is now, Achill’s Secret Garden. His wife, Doutsje Nauta developed a vegetable and herb plot, and has a full time job consolidating the garden. A Guided Garden Tour, given by an enthusiastic expert, who will tell you about the history, and unveil the secrets of the 13 chambers. An elaborate description of the tour is also available. OPEN – Mondays: 2.00 pm, Wednesdays: 11.00 am, Saturdays: 2.00 pm, with additional tours by appointment. Bookings: Achill Tourism: 098- 47353 or 087- 9260730. Admission: €8.00 (which includes refreshments in the boathouse). 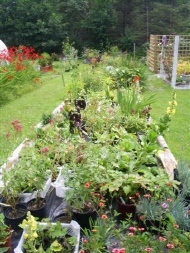 There is a possibility to buy plants from the Nursery after the tour. Postcards of the work of Willem van Goor are for sale in the boathouse.